The nearly forgotten story of how a radio amateur successfully detected transmissions from the first men to land on the Moon. In July of 1969 a ham radio operator and amateur radio-astronomer by the name of Larry Baysinger, W4EJA, accomplished an amazing feat. He independently detected radio transmissions from the Apollo 11 astronauts on the lunar surface. Fortunately, his accomplishments were recorded by Glenn Rutherford, a young reporter for the Louisville (Kentucky) Courier-Journal. 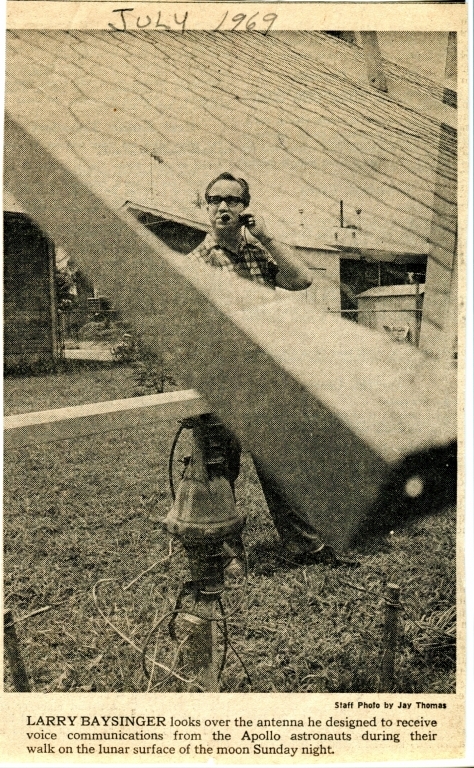 “Lunar Eavesdropping: Louisvillians hear moon walk talk on homemade equipment,” sporting Rutherford’s byline, appeared in the Wednesday, July 23, 1969 issue of that paper — front page of section B, the local news section (see Figure 1). The story discussed how Baysinger recorded 35 minutes of conversation from VHF signals transmitted between astronauts Armstrong, Aldrin and Collins (he did not attempt to pick up the encoded S-band signals from the main Moon-Earth communication link).1 These 35 minutes included the time during which President Richard Nixon transmitted a message of congratulations to the astronauts. Baysinger’s accomplishment earned him some brief recognition — a meeting with the Collins Radio Company, which supplied the communications systems for the Apollo spacecraft. Collins was impressed with Baysinger’s work. Then the story faded into the mists of time. “Lunar Eavesdropping” quietly sat in the rolls of microfilmed Courier-Journal editions in the reference sections of (mostly Kentucky) libraries, awaiting rediscovery. Providence brought “Lunar Eavesdropping” back to light this summer. Rutherford, now an assistant editor of the central Kentucky newspaper The Record, was interviewing me concerning the productive history-of-astronomy research program operated out of the Jefferson Community & Technical College observatory. Our discussion drifted into the subject of science being done in unexpected places by a small homegrown operation (such as a Kentucky community college observatory). This prompted Rutherford to mention Baysinger’s work and the attention he got from the Collins Company as another example of interesting, homegrown, small-operation science in Louisville. I was immediately intrigued, especially when Rutherford said he did a story on it that appeared in the Courier-Journal.2 He could not recall the exact date, so a few days later I was rummaging through the microfilm collection at the University of Louisville library. I found Rutherford’s story within an hour (with the help of my wife Tina and son Joe). 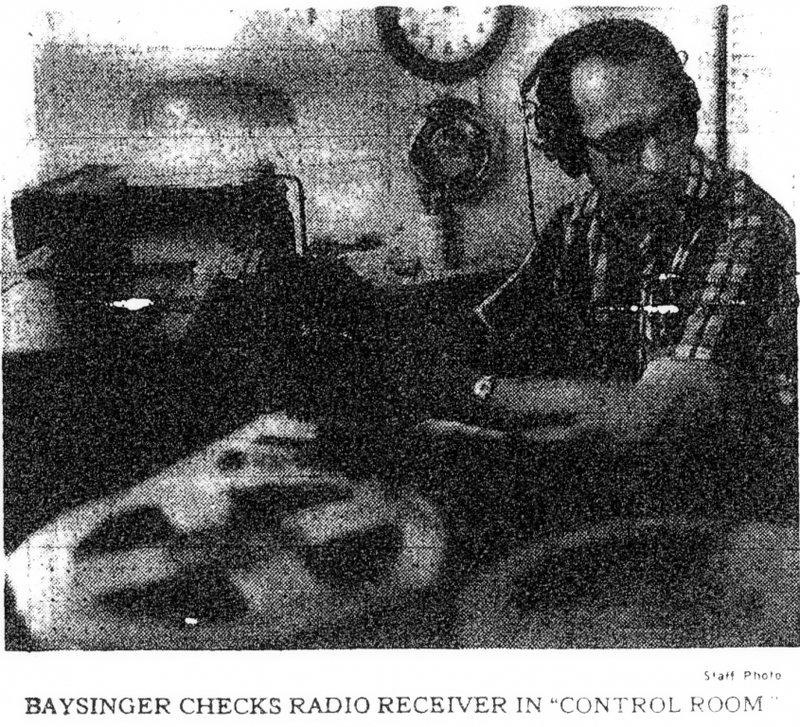 When I got back to Rutherford about how I was interested in the story and had found it in the July 23, 1969 Courier-Journal, he mentioned that Baysinger actually still lived in Louisville — retired from a radio career but still active in ham radio. In short order I was talking to Baysinger via phone and e-mail, learning more about the lunar eavesdropping project. So how did Larry Baysinger come to be eavesdropping on Apollo 11 the night of July 20, 1969? Baysinger told me that he got interested in radio in the early 1950s, when building a radio from scratch or modifying a military surplus device was common practice. Surplus WWII equipment was both available and inexpensive at that time and Baysinger has fond memories of high school road trips to Lexington (Kentucky) and Indianapolis (Indiana) where a radio enthusiast could find particularly good hunting for military surplus. His interest and talents in radio eventually led him to career with WHAS 840 AM radio in Louisville. (WHAS and the Courier-Journal were both owned by the Bingham family of Louisville and it was through this connection that Rutherford met Baysinger and became aware of his work.) By the late 1960s Baysinger was working professionally for WHAS and experimenting on the side with radio astronomy and satellite tracking. The lunar eavesdropping project arose because he had an interest in independently verifying the information that NASA had been providing about the Apollo program. Could he get unedited, unfiltered information about the Apollo 11 landing by eavesdropping on the radio signals transmitted from the lunar surface? Maybe he could find out things that NASA did not want the public to know about. In addition, successfully detecting a transmission from the lunar surface would be a great technical accomplishment. Various “experts” had told him that it could not be done. Baysinger says that on the night of the Apollo 11 landing, he and Rutherford had to essentially aim the antenna at the Moon by getting behind it and sighting it like a gun. This was difficult since the weather was cloudy and the Moon not easily visible. The antenna, which was originally built for Baysinger’s radio astronomy work, had a motorized steering mechanism but it had to be manually guided. Its “beam” or “field of view” was such that, once pointed at the Moon, it could be let go for a little while, but pretty soon it would have to be reaimed because the motions of the Earth and Moon caused the Moon to drift out of the antenna’s field and the signal to be lost. In fact, this was one piece of evidence that the Apollo 11 signals the receiver picked up were indeed from the Moon — if the antenna was not kept aimed at the Moon, the signal disappeared. Baysinger’s wife and daughter watched the Apollo 11 landing on TV while Baysinger and Rutherford listened via Baysinger’s equipment. The signal on the home-built equipment came through approximately 5-10 seconds earlier than the signal on TV. It was noisy, but you could hear what was going on. I asked Baysinger whether he found anything that NASA edited out — comments about things going wrong, the astronauts being loose with their language or exclamations about meeting space aliens. He said no — absolutely everything was transmitted to the public on TV. In fact he said, “that was kind of disappointing.” Part of the idea of the project was to hear the unedited “real story,” and it turned out there was nothing edited. Indeed, Rutherford’s story makes no mention of hearing anything unusual. Perhaps because there was nothing to hear that couldn’t be heard on CBS, Baysinger did not attempt to eavesdrop on any other Apollo missions. After Apollo 11 he moved on to other projects. Rutherford moved on to other stories. “Lunar Eavesdropping” was moved on to microfilm. It is possible that there had been other projects like Larry Baysinger’s and perhaps these projects were told in articles like Glenn Rutherford’s. Those projects and their stories might be sitting in a drawer somewhere, waiting for a QST reader to bring them to light. 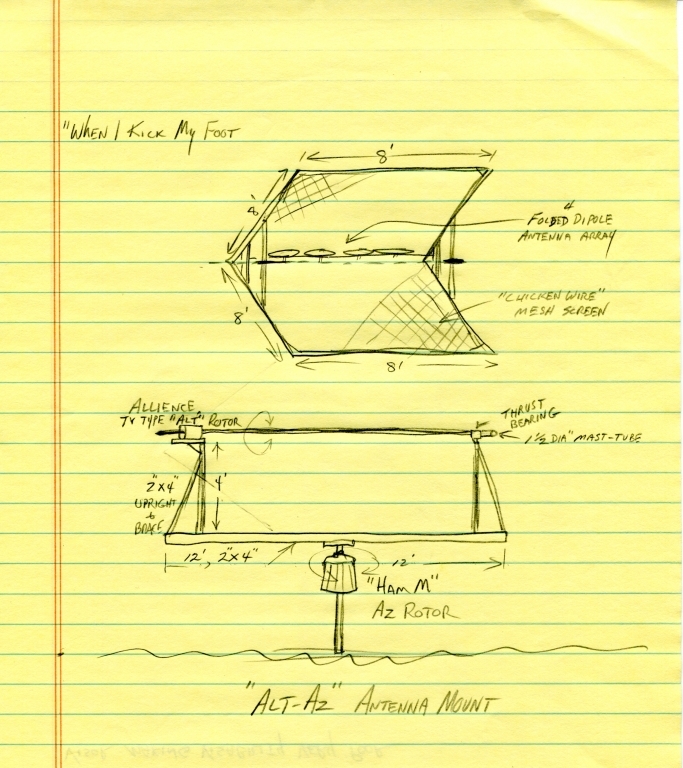 More information on Larry’s lunar eavesdropping, including some audio clips, can be found on Christopher Graney’s Otter Creek-South Harrison Observatory Web page, Lunar Eavesdropping In Louisville, Kentucky. All photos used with permission of The Courier-Journal, Louisville, Kentucky, except as noted. Christopher M. Graney is a professor of physics and astronomy at Jefferson Community & Technical College in Louisville, Kentucky. He can be reached at Jefferson Community & Technical College, 1000 Community College Dr, Louisville, KY 40272. 1The S-band covers 2-4 GHz, which encompasses the 2.3-2.31 GHz, 2.39-2.45 GHz and 3.3-3.5 GHz amateur bands. — Ed. 2I was intrigued due to my interest in astronomy’s history (this being an interesting story of radio astronomy). I was also intrigued because both in my classes and in our observatory public outreach programs I encounter people who ask whether I think we really went to the Moon. I thought it would be wonderful in those instances to have “on tap” a story of a local person independently verifying the presence of astronauts on the Moon. 3These searches were done in August 2009. Since then I have discussed “Lunar Eavesdropping” with many people, including those on a history of astronomy e-mail list, so more references to it may now exist. The Courier-Journal has an electronic database of articles, but it does not go back to 1969. 4QST readers interested in this story may want to look at Grahn’s Tracking Apollo 17 from Florida or Flagg’s University of Florida Student Satellite Tracking Station Web pages.